Earlier this month, Marvel Entertainment and Riot Games announced a collaboration to bring League of Legends stories to comics and graphic novels. This December, explore the world of Runeterra and access exclusive, never-before-seen content with League of Legends: Ashe: Warmother Special Edition #1! Following the origin story of one of the first League of Legends champions, League of Legends: Ashe: Warmother Special Edition #1 will feature over 20 pages of extras, including artist layouts, inks, colors, character concepts, and a glossary to dive deeper into the action and learn more about the tribes of the Freljord: The Winter’s Claw, the Avarosan, and the Frostguard. League of Legends: Ashe: Warmother Special Edition #1 will also be localized in 20 languages for fans around the world to experience Ashe’s story. League of Legends: Ashe: Warmother #1 will be released on digital platforms on December 19, with League of Legends: Ashe: Warmother Special Edition #1 on sale on the Marvel Comics App and Digital Comics Shop, Comixology, and Kindle devices. A graphic novel collecting League of Legends: Ashe: Warmother will be released later in May 2019. 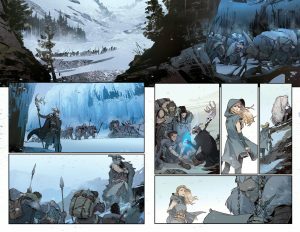 Get a first look at pages from League of Legends: Ashe: Warmother #1! Preorder League of Legends: Ashe: Warmother Special Edition #1 digitally starting December 5! Thousands of years ago, the War of Three Sisters nearly tore the frigid wilds of the Freljord apart. Today, the tribes descended from the three sisters — the Winter’s Claw, the Avarosan, and the Frostguard — still fight for power and survival. Ashe, daughter of the Avarosan warmother, trains to someday lead her people. Food is scarce in the Freljord. Warmth, even more so.